Sorry for the lack of posting this week, but I just haven’t had anything to write about. Rogue continues to grow and mature into a wonderful little girl. She is still learning to control herself around food, but we have now started to feed her with everyone else in the kitchen. We have Aspen and Canyon eat together using the bowl table, she used to share with Phoenix, and Cessna eats with Rogue on the other side of the kitchen. Rogue can get really jumpy and overexcited when she sees the food being prepared, so we have started to attach her to a leash that is around one of the couch legs. She seems to calm right down once she has the leash connected to her collar, so I’m hoping that she will learn with time, to just chill out and wait for the bowls to be put down. Other than that, we have been working on loose leash walking and are really hoping to have her ready for a Rally-O competition in November. Of course it will depend upon how much we practice and on whether her CKC paperwork comes in, but we can hope right? Other than that, I’ve been busy with school reading and assignments. I actually got my first assignment back today and received a stellar grade, so I’m happy about that. The group discussion portion of the course still frustrates me, but the professor is supposed to be reorganizing the groups after she has marked the assignments we handed in today. Today’s assignment was to discuss and reflect on the group discussions and on how we felt our participation could be better. I’m not really sure this one went as well as the first assignment, but there are three other reflection papers to improve upon. Nothing else is really new here. It has gotten really cold all of a sudden, so I’m sure we’ll have some snow pictures to share in the real near future. I was really hoping to have some more recent pictures of rogue to share with everyone, but it looks as though we have lost our camera. Maybe I’ll see if Huib can take some good ones with my IPhone. For now, I’ll leave you with a couple pictures Huib took in June of Aspen and Canyon. As I mentioned in an earlier post, I have returned to school. I am taking an online course and am so far finding it interesting. I’m having a bit of trouble getting back into the swing of student life, since I graduated from McMaster in June of 2007, but overall it’s going well. With this course, we do not officially work together, but we do have discussion sections on the course website where we must post our thoughts on each unit’s subject and then reply to others at least twice within that week. You’d think this was an easy task. The group I have been assigned to, seems to be comprised of worse slackers than myself. The first unit officially started on the 8th, but no one, including myself, posted their “original” post until late on the 15th. Only one other person posted something along with me, and then nothing else other than my response the following day to that individual, was done until the evening hours of the 18th, and the unit ended at 11:00pm. I had checked the website each day and checked in the afternoon of the 18th, but there was nothing, so I was left without the ability to post my second response. I went on the site yesterday to see what the topic was for the second unit, and what should I see? Two more people had posted their “original” post around 10:00pm on the 18th, and one of them had posted responses to two people!!! I really, really want to do well in this course, but am not sure it will be possible if I don’t have the ability to fulfill my discussion obligations. I know it is only the first week, but it’s still frustrating because I’m wondering if this week’s performance (or lack of) will be a pattern. I’ve thought about this question for weeks. Where was I? What was I doing? Who was I with? • I was starting my 3rd year at the University of Guelph. • I was living with Phoenix in residence. • I had been dating Huib for ten months. • I was looking forward to a bright future. I remember that morning. I remember walking down the hall from my residence room. I remember hearing a lot of people crying and talking in the lounge. I remember hearing the television. I remember stopping at the door of the lounge to listen. And, I remember the feeling of shock that came over me. I had not lost anyone that day. I had no real ties to America. But, I knew this day would change my life forever. September 11th, 2001 is a day that should never be forgotten. It is a day when we all learned that no one was safe. A day when the world stopped, and cried together. A day when thousands of people and special dogs were lost. Please take a moment, to remember and thank all who were lost. In June, I talked about wanting to return to school. I had decided to register as a non-degree student, and am hoping to take a course or two each semester between now and the fall of 2013. I’m tired of doing nothing, other than training with my dogs, reading books and cleaning the house. I know Huib does not hold my inability to get a job against me, but I still feel as though I’m wasting my life, sitting around. Yesterday was the start of course selection, so Huib logged into my student profile, and registered me for this course. When I was a student at the University of Guelph from 1999 to 2004, I majored in Criminal Justice & Public Policy, which primarily meant I took courses from the sociology and political sciences departments. I really enjoyed the political sciences, so focused mainly in this area when I had a choice, so there are actually very few courses left for me to take now that I am re-entering student life. I was attracted by this new course, Governing Criminal Justice, because not only will it focus on areas that interest me, but it is also primarily writing based, and there is no final examination. I haven’t done a final exam in over four years, so I thought it would be best to start off taking a course that was writing based, since this is something I’m quite good at. I am not a creative writer, but give me a topic to research and I have no issues producing a paper that might just knock your socks off. I’m not sure what the future holds in terms of my ability to find employment, but in the meantime I think I’ll try and better my educational background, so that I might be able to complete a masters when we move back to Southwestern Ontario. We got an e-mail from Karen of Red Labrador Retrievers to let us know that she thinks there are two females who might fit our needs. She said that she could be wrong, but from observing the litter, she thinks “ruby” and “pinky” will be a good fit – they name the puppies according to their collar tags. She describes “ruby” and “pinky” as being “very social, happy-go-lucky’s…middle of the road in the hierarchy, brave without being aggressive…they are all (entire litter) quick learners like both their mom and dad…all (entire litter) are happy to please, of course some more than others and they (“rudy” and “pinky”) are middle of the road their also…” We’ll have to wait for the test scores, but at least we know that there is most likely a puppy or two for us to choose from. We got some very sad news from our friends, the pawpower pack. Mr. Pawpower’s golden companion passed away unexpectedly. Here’s some more details. I haven’t had the experience of losing a beloved companion, but know from losing both my mother and grandmother, that it can be heartbreaking and the wounds will take time to heal. Our thoughts go out to Mr. Pawpower and the rest of the Pawpower Pack. Rest in peace Rudy, you will be sadly missed. I’ve been doing some research on courses I might want to take through the University of Guelph or McMaster University. I haven’t been able to find work and am tired of sitting around doing nothing, but training with the dogs and housework. I’m thinking that I’ll take a course or two each semester via distance education through one of the above universities and then hopefully re-apply for masters or occupational therapy when we move closer to London (Ontario) in a couple of years. Huib’s contract with the Kirkland & District Hospital is over in a year and if we can get rid of a couple more debts between now and next fall, I think we might look at moving back to southern Ontario, closer to friends and family. It’s been a wonderful experience living here, but it’s just not home. My sister found out that the woman who owns the house she is renting wants to sell this summer. She doesn’t really like living here and thinks she will try and find work around Orillia or Gravenhurst. She’s going to visit some friends next weekend in Aurora, so has asked me to help her re-design her resume so she can hand some out on her way down. I’m excited to know she will be moving closer to her friends and a place she loves, but am secretly sad that she will be leaving. I know she can be frustrating, but I will really kind of miss having her so close. 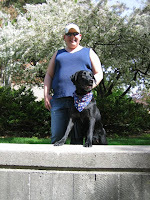 Finally, I have been in contact with a woman who runs a program that helps people train their pets to be service dogs. She used to work for the Lions Foundation of Canada as a Special Skills trainer, but has been working on her own program for about five or more years. The program is called Encouraging Paws Service Dogs and their website can be found here. The Director has informed me that her fees are $12,000 for assistance from puppy hood through to certification and follow-up help. This is a little out of our price range, so we have asked her how much she would charge for just help with certification. She said that her price is $5,000 for certification which is ten hours of assessment. To pass, she says that the dog must meet the standards of “the Blind Dog Act Federation” but I think she means the International Guide Dog Federation. She also informed me that her fee for advice and/or consultation is $500 an hour or $8.33 a minute. I’m not sure if we’ll end up going with Encouraging Paws, but at least we know there is someone willing to certify and/or provide consultation during the training process. I have some other contacts who have offered to give me advice and information when needed, so I think we’re finally ready to officially raise and train Cessna’s successor!! Saturday was a pretty lazy day, but Sunday was a little more exciting. A friend’s sister had begun to e-mail me regarding the possibility of fostering Amber. She has never fostered before so mainly wanted to know her responsibilities and whether she was able to take Amber everywhere with her. After a few e-mails back and forth she talked with her parents and they were all for her fostering. 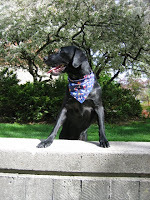 Meghan attends the University of Guelph so Amber will get tons of time in classes, as well as, tons of time to be a dog since the student life is not always overly demanding. Sunday afternoon we packed up Amber along with all of her things and headed off to Meghan’s place. When we first arrived Meghan and her roommate were not home, but a short time after we went back to the car they arrived with bags full of things for Amber. She got her new bowls, a leash, and some toys…what a spoiled little girl! Amber was quite excited to meet Meghan and they seemed to fall in love instantly. Amber almost immediately began to make herself at home, wandering the house and checking out Meghan’s roomate’s dog Jack. After going over some things, we turned to leave, Amber wasn’t so sure about this and ran out the door. We got her back in without too much difficulty and said our good-byes. Meghan’s sister called me that evening to let me know how happy Meghan seemed. She said that she thinks I might have made her year . As I hear more I will update everyone on Amber’s progress. After leaving we headed out to the University to begin planning our walk route. This coming Sunday morning will be Guelph’s 2nd Annual Purina Walk for Dog Guides so I want to make it as perfect as possible. This year the walk could not take place at the park we had done it at last year because some booking issues had occurred and by the time we had put our request in the s pace was gone. The University’s V.P. Student Affairs came to our rescue though, offering to pay for the rental fees if we wanted to use their Arboretum Centre. The facility is beautiful, the only problem is no dogs are allowed inside except for working ones and I assume fosters as well. Having no real other option we decided on taking up her offer and began the process of planning the day. The day will begin with a catered sort of breakfast provided by the University’s food services department. Then the walk will commence and afterward there will be raffles and fun dog contests. In planning the route we decided to first walk down the main driveway and head onto main campus. We walked through various areas of the campus stopping at one spot to take some pictures of Cessna and I. Cessna found the campus to be quite interesting with all the squirrels running about and the fields where she could run. I guess she hasn’t been there enough to get over the excitement yet. Phoenix lived and worked with me on this campus for five years so the novelty of it all sort of wore off after the first year there. After about an hour and a half we were done planning the route. This year the walk will be about an hour and fifteen minutes of walking, a little longer than it is supposed to be, but the walk is pretty scenic in spots so I am sure the community members coming out will enjoy it. I think as a preliminary precaution though we might figure out where the halfway point would be and have volunteers let the walkers know that if they turn around there then once they reach the centre again they will have done half the walk. I don’t want people getting too tired or warm not having the chance to take a shortcut. The route follows the main driveway from the Arboretum Centre and then goes through campus by their new Science Complex and then goes along Gordon Street to College where they will turn and walk by War Memorial Hall (a beautiful building) and by some of the residences such as McDonald Hall, Mills Hall, and Johnston Hall. Once they reach Wineguard Walk they will turn and go past the main cafeteria (Creelman Hall) and then pass by the library and some other older buildings. They will then turn down towards the Athletic Centre and head back towards the Arboretum Centre this time walking along some of the paths rather than the main driveway. I am looking forward to all of this being done, it has been a stressful process, but hopefully it will be all worth it in the end. Today wasn’t too eventful, we only went out to the school yard near our place to play some fetch. The weather has become quite warm and humid and Aiden is having some trouble adjusting once again.